The fish are not terribly difficult to fool under the right conditions, and it’s easy to find sections of the river with room for beginning fly casters. The best fishing will be from mid-March until late October. 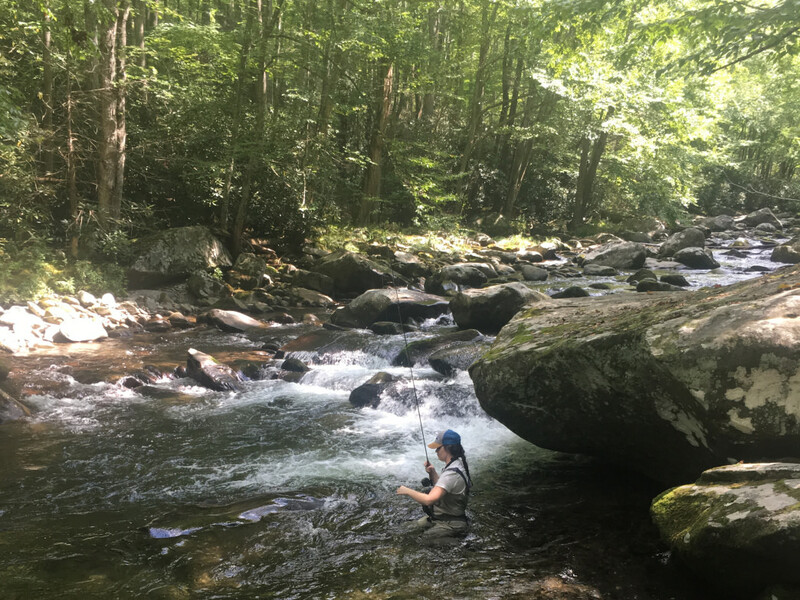 If you want a variety of fish species and conditions, the Middle Prong of the Little River above Tremont is a great option. From accessing wading spots by car or hiking up smaller tributaries to hunt native brook trout, there are seemingly endless options around here. This is a popular section of the river, but there is less pressure and fewer anglers as you go further upstream. Once you get to the Tremont Institute and Event Center, you can either fish along the road for smallmouth bass, rainbows, and the occasional brown trout or hike along the Middle Prong Trail for native brook trout and small rainbows. The trout above Tremont are wild, tricky, and absolutely beautiful. As you go further up the road and onto the Middle Prong Trail, you’ll find more aggressive fish that will more readily take your fly. Small nymphs under an indicator are a good choice all year round if you’re in doubt. During the spring and summer, dry flies are typically effective from mid-morning on. During the late summer, locals love to fish a greenie weenie at the end of riffles. As with any fishing in the Smokies, you’ll want to keep a low profile, use long leaders with light tippet, and move quickly. If you don’t catch a fish in a pool or riffle, keep moving upstream. If you fish three or more spots without any action, consider using a different fly and technique. Conventional anglers should use in-line spinning lures or small jigs. If you want the best of everything that the Smokies have to offer, Tremont is a great area to concentrate on. In the span of a few miles, you can target every species of fish that anglers pursue in the park, while surrounding yourself in gorgeous scenery. This is a fantastic place for beginners to go and try out all the techniques that they’ve been studying. If you lose confidence on one section of the river, you can travel up or downstream and find a scenario that you’re more confident in. If you like to hike, you can also link up to several trails to see scenic waterfalls and find native brook trout. Enter from Townsend and make a left at the fork, then take a left towards the Tremont Institute. Drive until you drive past the Tremont Institute (which will be on your left) and find a place to park depending on the type of water that you want to fish. All anglers must have either a Tennessee or North Carolina fishing license with a trout stamp. Natural or processed bait is prohibited, as are double and treble hooks.